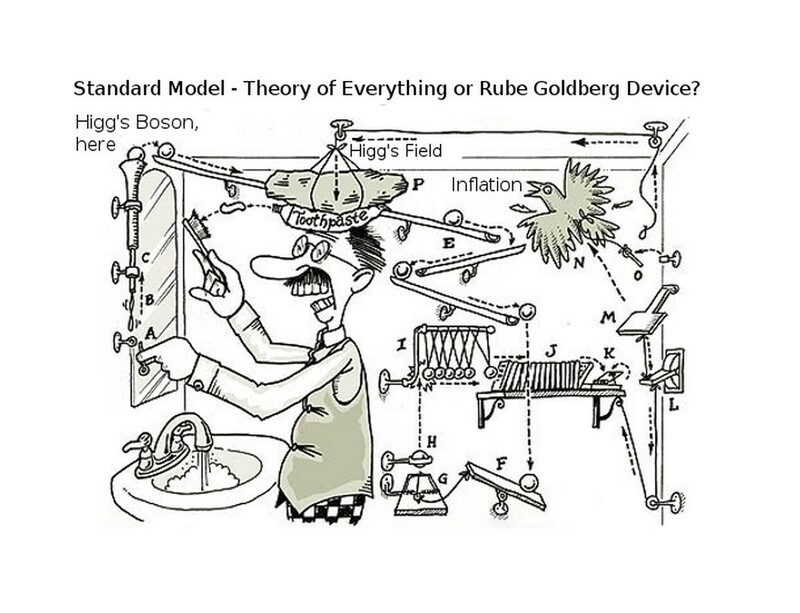 Recently there was an article by Tim Reyes asking if the standard cosmological model is a Rube Goldberg machine. The idea is that so many ill-fitting ideas have been put together that it seems unreasonably complex. I’ve used a similar criticism against certain models through the phrase “tweak theories are weak theories.” Given the latest implications that the Higgs field may contradict inflation, and the BICEP2 results may not hold up, should we really think of standard cosmology more as a tweak theory than a robust model? The current standard model of cosmology, often called the LCDM model, is basically as follows. About 13.8 billion years ago the observable universe was hot and dense. Then, driven by gravity, dark energy (L for lambda, which is the symbol for dark energy in general relativity) and cold dark matter (CDM) it expanded while galaxies and clusters formed, leading to the universe we see today. Since dark matter is a mysterious material we haven’t seen directly, and dark energy is even less understood, it is tempting to see them as “tweaks” just to make a model work. This urge is particularly strong given that these things aren’t only necessary for the LCDM model, they supposedly make up 23% and 73% of the known universe. Regular matter like planets and us are less than 4% of the universe. A model where 96% of it is hypothetical “stuff” hardly seems very scientific. But taken from an observational approach, however, the LCDM model seems strikingly robust. There are three main observational tests for the model, which are sometimes referred to as the pillars of the big bang. These tests agree with LCDM to a degree that is almost unparalleled. The first pillar is the redshift-distance relation. This relation was first demonstrated by Edwin Hubble, using the Cepheid variable period-magnitude relation discovered by Henrietta Leavitt. By using Leavitt’s relation, Hubble could determine the distance to dozens of galaxies. He then observed their Doppler redshifts to determine how fast these galaxies move away from us. What he found was a linear relation between galactic distance and the speed at which the galaxies move from us. It was the first evidence that the universe was indeed expanding. Since Hubble’s first discovery of this relation in the late 1920s, we’ve made ever more detailed observations of the effect. Using the brightness of distant supernovae we can determine the distance of galaxies billion of light years away. From this we found the universe is not only expanding, but that space itself is expanding. Our observational data is now precise enough that we can distinguish between a universe where galaxies are moving through space (like an explosion from a point) and a universe where space itself expands over time. The observations clearly match cosmic expansion. While this concept might seem quite odd, it is easily describable within general relativity, which has been verified experimentally countless times. The second pillar is the cosmic microwave background (CMB). Often the expanding universe is imagined as a loaf of rising raisin bread. But just because the raisins are expanding away from each other like galaxies, it would be silly to claim the bread began as a primordial dense state. So why do we assume this for the universe? Because the CMB tells us this. If the universe did begin hot and dense, then there should be an afterglow of that original heat. If space is really expanding, rather than matter exploded from a point, then the afterglow should be seen in all directions. Not only that, the afterglow should appear thermal. In other words, its spectrum should match that of a blackbody. What we find is exactly that. The thermal glow has cooled so that it is now seen in microwaves (hence the term), and it is seen in all directions. Not only does the CMB appear thermal, but it is so close to a perfect blackbody that it is one of the best experimental fits humanity has ever done. 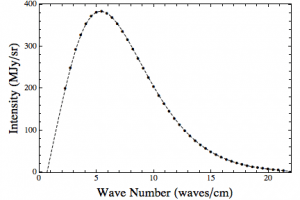 Since the discovery of the CMB in the 1960s, space observatories such as COBE, WMAP and Planck have measured tiny fluctuations in this background. The scale at which these fluctuations occur tell us something of the amount of dark matter and dark energy. Basically the more dark matter the more fluctuations there should be, and the more dark energy the more spread out these fluctuations should be. What we find from the latest data is that the CMB predicts a universe with about 23% dark matter and 73% dark energy. This matches the rate of cosmic expansion as seen in measurements of the Hubble relation. So the first two pillars are in good agreement. The third pillar is perhaps my favorite, and it deals with the abundance of elements in the universe. Since the cosmic microwave background is the light when the universe finally cooled enough to be transparent (known as recombination), we can determine the temperature of the universe at that time. Given our measure of dark energy, we know the rate at which the universe was expanding before that, and therefore we know the temperature of the universe when the first nuclei of atoms were forming. The thing about nuclear fusion is that it is very complex, and it is highly dependent upon the temperature and density of the nucleons. Change the temperature a bit one way or the other, and the initial ratio of primordial elements would be different. So pillars one and two make very specific predictions about the abundance of elements. Looking at some of the most distant quasars, we have found two examples where they illuminate primordial gas clouds. We can tell that they are primordial because they don’t contain any trace of heavier elements. When we compare the ratio of hydrogen to deuterium, we find that it agrees perfectly with the prediction of elemental abundance. Other observations of slightly less pristine clouds find similar agreement for the ratios of helium and lithium. This is perhaps the most difficult pillar to verify, but all evidence so far agrees with the predictions of LCDM. Various observations of the state of our universe. The yellow triangle agrees with all of them. Sometimes a fourth pillar, known as Olber’s paradox, is listed as well, but the big three are the ones that really put LCDM specifically to the test. Beyond that there are other tests such as the baryon acoustic oscillation (BAO) that looks at the distribution of galaxies in the universe as a measure of dark energy, or the Alcock-Paczynski cosmological test, which compares the LCDM model to other possible big bang models. All of these make specific predictions about the big bang, dark energy, dark matter and the age of the universe. They agree to remarkable accuracy. This doesn’t mean there still aren’t questions about many of the details. There are some big mysteries, such as early inflation and how the Higgs field comes into play. With new observational data being gathered, there will be a lot of arguments about the details and difficulties. But all of these arguments are not about the LCDM model as a whole. Even if we discover a radical new understanding of the universe, the LCDM model will continue to work amazingly well. Even with its challenges, the LCDM model is not a “tweak theory”. It is a robust model of the universe supported by a great deal of astronomical data. They appear to be reputable researchers at reputable institutions. I’m just a Rube – so I’m jest askin’ . Looks like they are researching a more speculative area of astrophysics. Could prove useful, might not. It is perfectly valid work. Would you ever consider reviewing the issues they are exploring in one of your posts? http://newscenter.lbl.gov/2014/03/03/standard-candle-supernovae/ back in March, and – tho I’ve read around the subject since then – I still can’t grasp the reasoning. Hi Brian, I looked at your first diagram (z-shift mapped in dependency to distance) You said “What he found was a linear relation between galactic distance and the speed at which the galaxies move from us.” and I see 2 lines drawn in within the diagram but what I also see are a lot of galaxies being all over the show within the diagram. I understand that the galaxies speed through the space itself has an influence on z but I don’t see a linear relationship for galaxies more then 3000 Mpcs away. I agree that there is no galaxy been found which is further away then 5000 Mpcs with z 1 which basically means that all the close galaxies move away from with some low speed maximum. 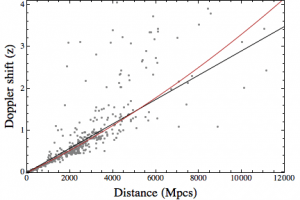 While I agree that all galaxies within 1000 Mpcs have a more or less linear relationship between z and distance – I struggle to accept the same claim for galaxies with a distance greater then 3000 Mpcs. That particular graph was one I made myself, using a limited amount of data. The black line is a linear fit, while the red line is a “best fit”. I used it as part of the textbook as a demonstration of how such things are calculated. So it wouldn’t be rigorous enough for a scientific paper. The real evidence for cosmic acceleration is much more clear, and relies on much more observational data. Sorry, I sounded really critical within my comment, it wasn’t meant to be that way. I just want to say that I really enjoy reading your articles – and I enjoyed this one especially, I had to read it twice to take it all in. I really like to read about dark matter and dark energy because it shows me that all the stuff I’m made of and the energy which keeps me moving is by far not everything nature has to offer. I just hope that I’ll be still alive on the day they figure out what dark matter and dark energy actually is 🙂 But saying so, the most satisfying outcome of any astronomical research would be the confirmation of other life forms. Didn’t seem critical at all. You clearly pointed out a weakness in the graph.